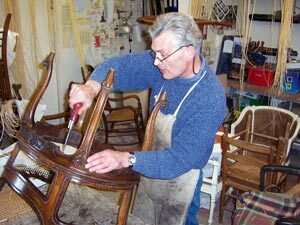 Based in Dorset, expert craftsman Steven Warrington has restored antique chairs and furniture for over 20 years, specialising in the restoration of cane & rush, danish cord and bergere furniture. Caners & Upholders can tackle any chair restoration, old or new. So, if you have a piece of cane or rush furniture and are considering restoration or even want your Habitat-style dining chairs re-seated please don't hesitate to get in touch. Alternatively, please take a look at our chair restoration portfolio to see the new life that can be given to your furniture. Various collection or delivery option are available, please get in touch for more information.